Log in to access secured My LAWPRO content, tools, and resources. 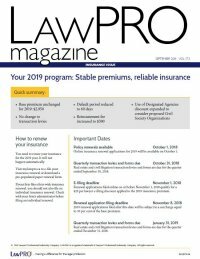 LAWPRO provides errors and omissions insurance to more than 27,000 members of the Law Society of Ontario. LAWPRO's TitlePLUS title insurance program is available to Canadian lawyers and Quebec notaries. Copyright © 2018 Lawyers' Professional Indemnity Company (LAWPRO), all rights reserved.